What are the thermal applications of solar water heating? - Water heating for houses and residential complexes. - Water heating for hotels. - Heating water for factories and industrial companies. - Heating of swimming pools. - Solar water desalination plants. 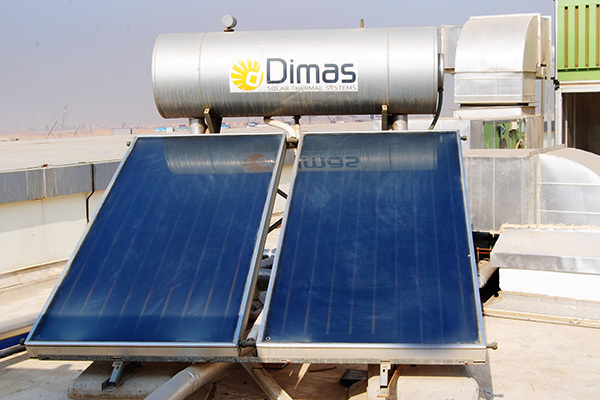 The solar heater works to heat the water using solar energy by means of complexes that receive the solar radiation in different systems, which allows the user to use the system appropriate to its conditions. What types of solar complexes? - The possibility of installation on the surface. - Best for industrial use. What are the benefits of solar water heater for the consumer? - Savings on traditional energy consumption such as electricity and petroleum fuels. - Savings in waste of government subsidies on petroleum products. - A friend of the environment. - Reduction of pollution and thermal emissions. Will the solar heater always provide hot water? Solar heating systems are equipped to ensure hot water throughout the day and all kinds. Solar water heater systems are designed to provide hot water to the consumer at all times throughout the year. However, in some areas only and in winter, sometimes the acquisition of solar heat may not be sufficient to provide enough hot water. In this case, an additional tool is usually used to increase the power, such as gas or electricity, to heat the water, although most areas in Egypt have sun all year long. What is the solar heater? 1 - The required temperature. 2 - quantity of water required. 3 - Number of consumers. 4 - Number of bathrooms and kitchens. • The surfaces are slanted and flat. • Access to the installation location. • Available area 200 liter tank needs an area of ​​2 square meters. • Al-Sokhani weight is in the range of 100 kilo per cubic meter. • Orientation (facing the south) and the absence of a hindrance. - Determination of the amount of hot water required. - Choose the place most suitable for installation. - Calculate the size of the surface area of ​​the solar complexes and the size of the reservoir. What is the required size for the solar water heater system? - The choice of the required size is based mainly on the number of individuals taking into consideration the number of bathrooms for the home system. - According to the standard of plumbing, the family of four to six individuals use 200 liters to 300 liters per day. • Check the delivery form. • Ensure that the heater is installed southward. • Make sure there is no shadow barrier. • Check that the water heater is working properly. • Know how to perform routine maintenance. • Know when a qualified maintenance technician is called to check or replace spare parts. • Know the details of the guarantees covered in the installation process. • Take care to clean the roofs of the compounds periodically once a month. • Contact the company in the absence of hot water.